I was reading johny fincham book and he had mentioned to see how fingers are set especially he has mentioned low set mercuy finger has having an absent father or mother at childhood days and that kind of condiiton makes you choose a partner differently like dominating ect..
1) is the concept of low set a relative term, usually low set is in accordance to different finger set. 2) usaully i have seen mercury finger low set than other fingers, is there a measure by which you can say that it is really low set. 3) How does set of finger play a role in depciitng a person personality, like does the mount area becomes smaller due to low set is this the rationale why palmist mention low set might have such an impact. Please explain about this iam confused. 2) it is classed as low set when the crease line between lower and middle phalanx is level with the crease where apollo finger joins the palm. Thaks for the info. Could you tell me what could be the meaning of low set finger especially mercury finger. also is low set only in reference to appollo not w.r.p.t other fingers. if the lower phalanx of mercury finger is short, there is more chance to find it low set, isn'ti it? 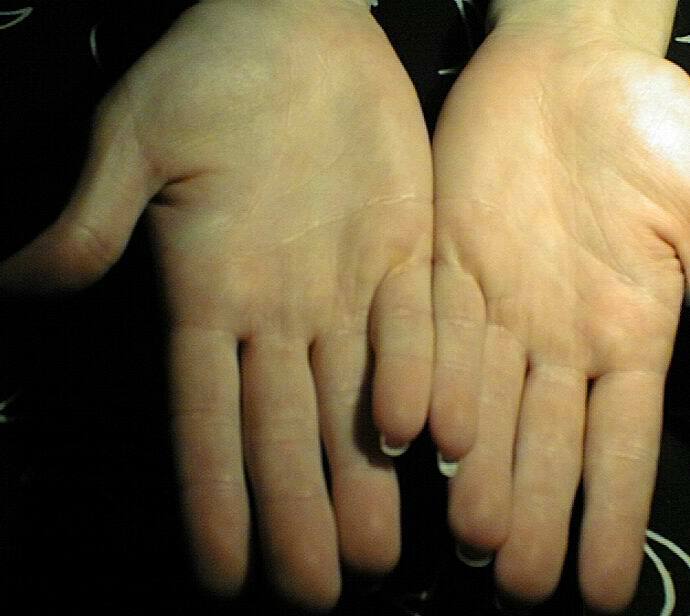 For example, in my left hand, the lower phalange is very short and the crease line between lower and middle phalange is nearly n level whith the crease where apollo finger joins the palm. But in my right hand, the lower phalange is longer, so the crease is above the level of the crease of apollo finger: isn't it low set like the other? yes I see what you're saying Laurah. The crease line is a guideline, you also look at how low the finger is set, and you'd look for confirming characteristics in the start of the lifeline, heartline, headline for the childhood things that Johnny mentions and the 'fear of abandonment' issues. Often these things show more on the passive hand - stuff from the past that affects the inner person. Hi Anand, sorry I've only just seen your msg. Low set has similar inference as short finger. Being low set 'holds the finger back', reduces its potential, affects the way we use the characteristics or rulership of the finger. ie in mercury's case especially communication and relationships. I use apollo as a guide, but everything in the hand is relative to everything else, so if apollo is set high or low then you'd take that into account when judging setting of mercury. Thanks for the information, In some sense i do have a little bit low set (not very low) compared to other fingers. however my mercury finger is long which probably can compensate. 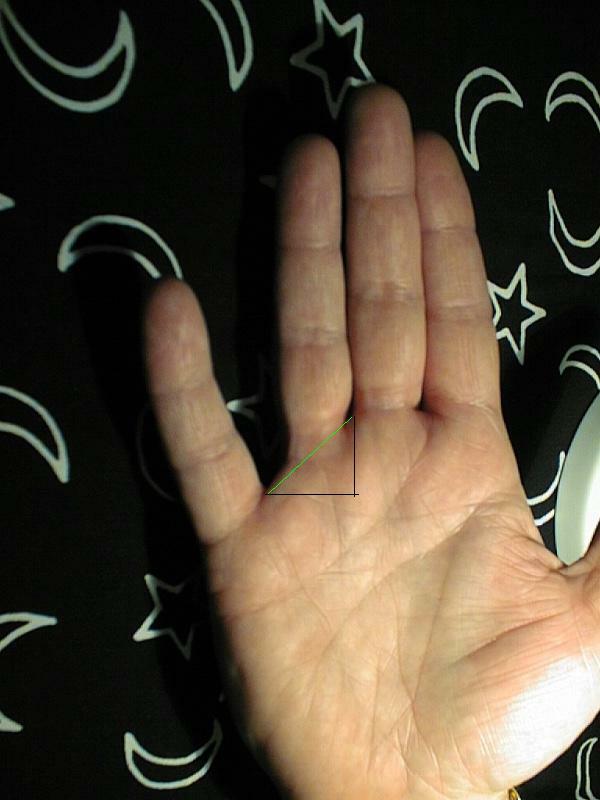 the other way to identify is: Look at the total curve formed by all the fingers at the edge of the palm where they join. It should be like a regularly curving like a cresent. If there is a sudden dent or low setting at the Mercury finger side(which disturbs the curve flow), then its a low set Mercury. Thanks for the tips, good idea kiran to look at it. One more question, i think it is andrew fitzherbert book wherein he mentioned that we have to seperate fingers and then look for low set (in case i use ur approach then i have to draw a curve after we seperate) whereas in johny book he mentions low set needs to be looked at by closing fingers tightly. Now which approach needs to be applied. Sometimes it is the posture of the hand that makes the little finger appear low set. Here are samples of low set little fingers. Thanks for the pics, is shown in the image file which i have drawn as a diagonal in the rectangle, if iam right is that going to be demonstrative of low set. I tried keeping my finger pushed inside to arrest the projection of little finger and then i see that sharp dip is lesser. So when we keep our fingers tightly closed then the little finger projects itself in the front which makes the dip look more steep, which can also give a low set appearance. the moment the finger are seperated in natural way then angle of steepnes is different and lower. I would probably go by fitzherbert of keeping a natural seperation adn seeing a low set. After a while it becomes something that you just notice from the experience of seeing many hands. IMO, it is better to go with a posture where in the fingers are close to each other. 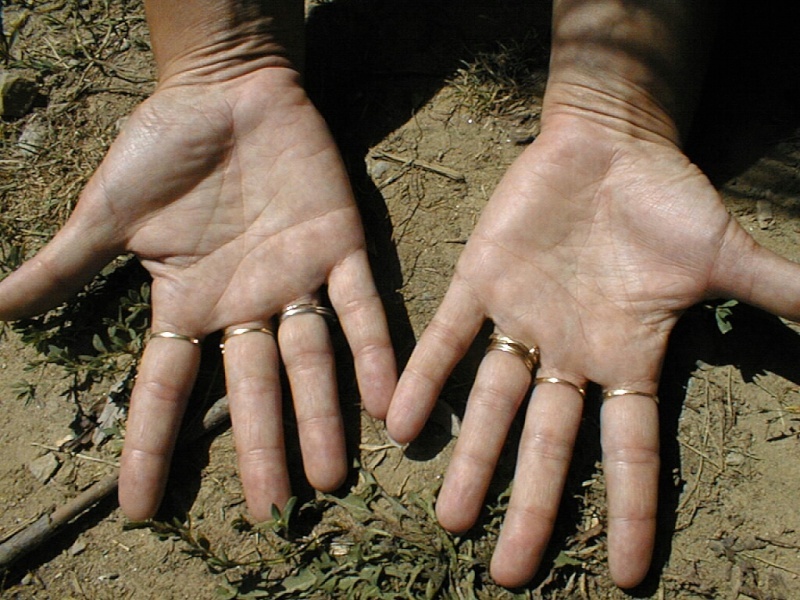 When spread wide, the skin between little and Apollo fingers erects and it gives an appearance as though the setting is not low. However, its not the skin, but, actually setting that has to be seen and that becomes apparent only thru closely held fingers. I think low set can often be related to how the hand is held and this goes back to the angle of the palm from the wrist and the fingers from the palm. But, how the hand is 'naturally' held has relevance too. The appearance of a low set little finger in how the hands are presented would represent the attitude of the moment. 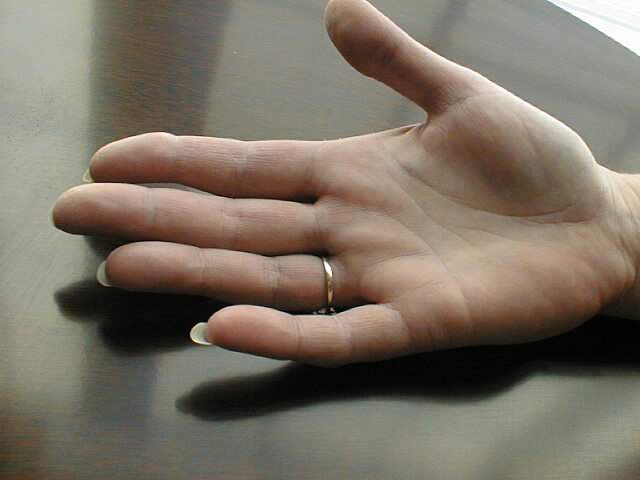 If the hand is adjusted to flow naturally from the arm and the little finger is low set, that is more likely genetic. Here is a photo I took a few years ago of a really short little finger that is also low set. 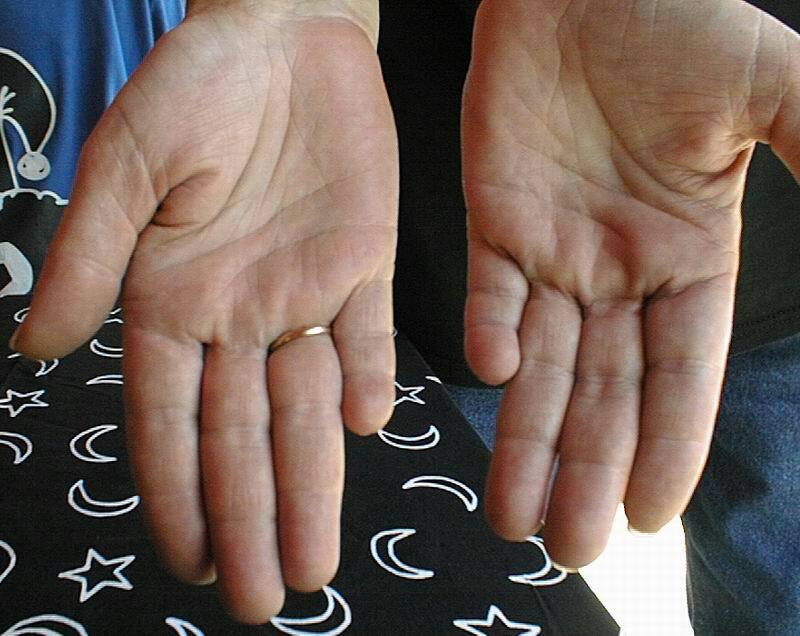 do you remember Patti, what were the characteristics of the owner of these hands (especially aboud feeling loos abandonment etc.)? I don't recall this person's story, they are saved from over ten years ago. 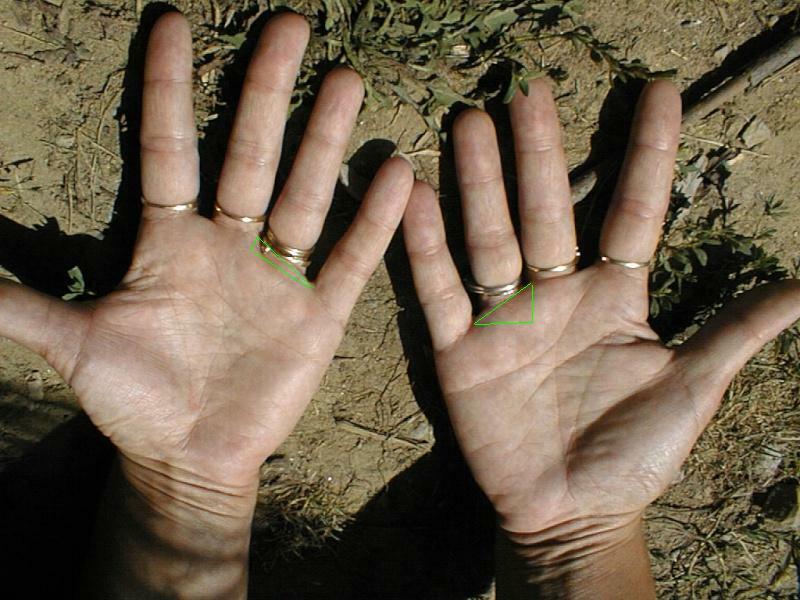 The multiple rings worn on the fingers is often a sign of some kind of insecurity. But these hands look pretty strong in many ways. Curious what triggered the thought about abandonment? p.s. I looked back at the folder and have two other photos. I took the pictures because she has an interdigital whorl between the little and ring of her left hand. From my notes, the group of people were from a local tv station at their company picnic. That's all I have. Just realized you may have not noticed that I wrote that this example was *not* low set above the image. I'll make it in bigger letters. Curious what triggered the thought about abandonment? That's a good topic too! I wouldn't apply abandonment to the image you copied over. Agree with you that it is normal. 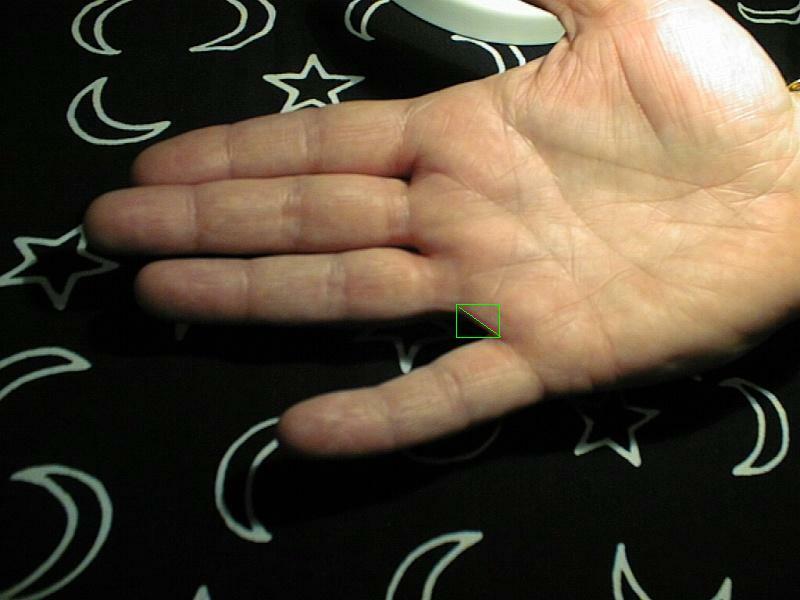 If you look in the recent image of low set short little finger, the little finger is projected in the front and due to that the meeting point palmar skin is pushed more in the front and this gives an appearance of a sharper dip ( this probably in my guess would apper if there is more mount area beneath the little finger and due to the curvature of the bottom base of little finger). Is this a right approach from your pics i thought looking from middle finger point of view and drawing an angle when the fingers are spread natutally would be easier to understand on low set. I don't understand your triangles Anand. Sorry i forgot to explain, all i meant was to show the angle of inclination by using a traingle, i could have drawn the traingle upwards also. The greater the angle of inclination the more steeper the more low set it would be.